On Friday, December 9, some of the filmmakers behind Captain Power and the Soldiers of the Future gathered at the Dark Delicacies store in Burbank, California, to promote the recent release of the DVD collection. 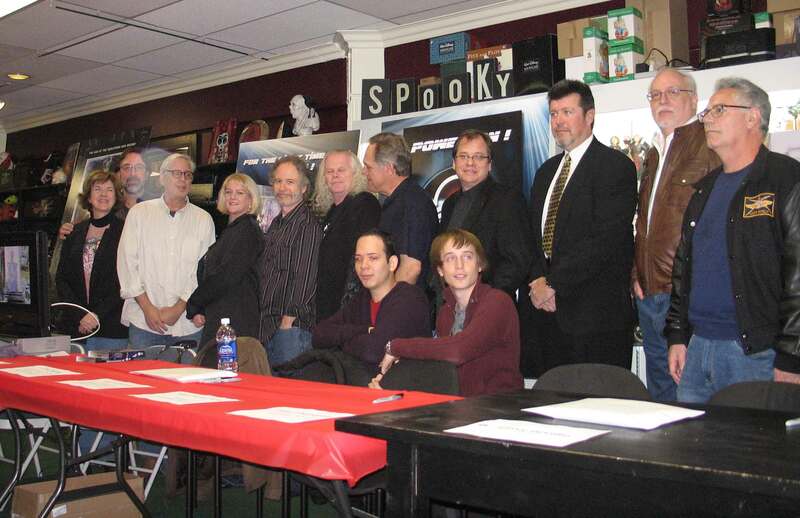 The attendees included (below, right to left): Larry DiTillio (Writer), J. Michael Straczynski (Head Writer), Timothy Dunigan (Captain Jonathan Power), Marc Scott Zicree (Writer/Developer, not in photo), Robert DeLapp (Special Effects), Ted King (Sound Design Producer), Forbes Candlish (Producer), Gary Guttman (Composer), Eric Carnagey (Co-producer, “Out of the Ashes” , seated right) Roger Lay Jr (DVD Producer, Captain Power & Skeleton Warriors, seated left), plus several writers from the Skeleton Warriors series: Next to Guttman, right to left: unknown, Dean Stefan, Eric Lewald, Julia Roberts Lewald. Prior to the visit, the Captain Power team solicited questions on Facebook, and provided answers in a followup video that covered the event. I asked about “Eden II,” a Shangri La-type place for refugees from the Metal Wars. Where was it? The show was cancelled so audiences never learned more about it. Until now. The DVD documentary, “From the Ashes,” actually reveals a design of what Eden II looked like, at least in conception. Then the locale was, apparently, moved to Earth. Larry DiTillio said that location is “classified.” Which is strange, considering the show has been dead for over twenty years.